DVI Extender includes a 3.5mm audio mini jack input so you can connect audio from your computer! That means you get full 3D accelerated graphics and audio from your computer to SDI. Perfect for digital signage, Flash™ playback, PowerPoint™, gaming and more! Now any software can be output to SDI! 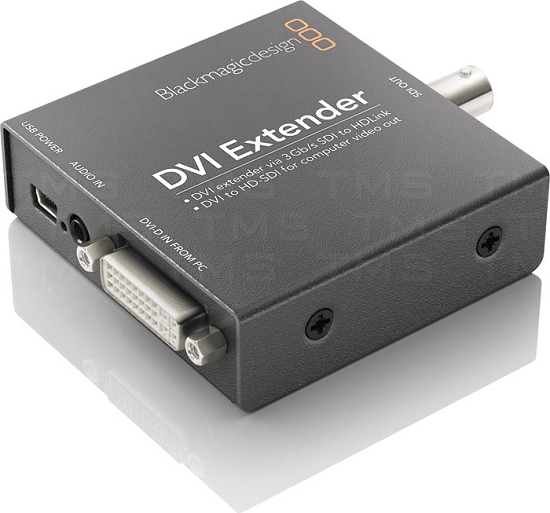 Unlike older scan converters, DVI Extender is a full digital converter that connects the DVI-D output on your computer to SDI equipment. That's a direct pixel-for-pixel digital connection to SDI, which is the highest quality possible and eliminates all scaling problems! That means longer cable lengths, without glitches in your video.